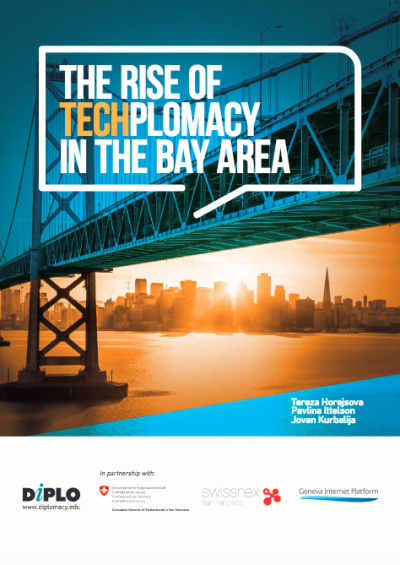 [Updates] On 12 April, DiploFoundation and the Geneva Internet Platform, in partnership with the Consulate General of Switzerland in San Francisco and swissnex San Francisco, launched the report The rise of TechPlomacy in the Bay Area. Read the online version, or download your copy. Read more about the event, hosted by swissnex. [Upcoming] See a video clip from a session dedicated to Bay Area techplomacy at RightsCon in Toronto. The Internet industry in the Bay Area is of vital importance for almost all the countries in the world. Apart from being the centre of technological development and home to many hi-tech corporations, the area also has a significant impact on society; what takes place there affects people worldwide, including the environment and context in which diplomacy operates. Bay Area Internet companies provide services for, and store the data of, citizens from all countries. Being at the forefront of technological advancements, the Bay Area Internet industry plays a key role in global cybersecurity, the protection of critical infrastructure, dealing with fake news, and other trends to which governments will need to respond (such as AI or Internet of Things). Yet, countries often struggle to find the right model on how to interact with an industry whose work has an increasing impact on issues that are of vital importance at the domestic level. This project is designed to analyse the way countries interact with the Internet industry in the Bay Area in order to promote the interests of their industry and citizens. It will analyse the different methods countries use to interact with the Internet industry to achieve their goals. The results will help under-represented countries develop their own methods of representation with the Bay Area Internet industry, as well as help the Internet industry players better understand the goals of the national governments and diplomatic services. Diplo will analyse different co-operation models that countries use to interact with the Internet industry in the Bay Area. Key actors will be interviewed to assess the current motivations and challenges on behalf of the countries, as well as their strengths and successes. The report will include methods and trends of interaction by countries in the Bay Area, as well as the major obstacles and challenges. The complete study will be presented on 12 April 2018 in San Francisco, USA.